A catalogue of Deeds and Charters in the Shrewsbury Free Public Library, as it was then known, contains a list of assorted documents which have now come into the possession of the Shropshire Archives. It is a series of leather bound volumes, comprising a numbered list of descriptions written from 1905 onwards. The items are in no particular order; they can originate from vastly disparate time periods. One such item was a roll of apparent 15th century date. It contained a list of “the names of certain Archers lately assigned to certain Knights and Esquires for the King’s journey through Cheshire”, according to the original catalogue entry. 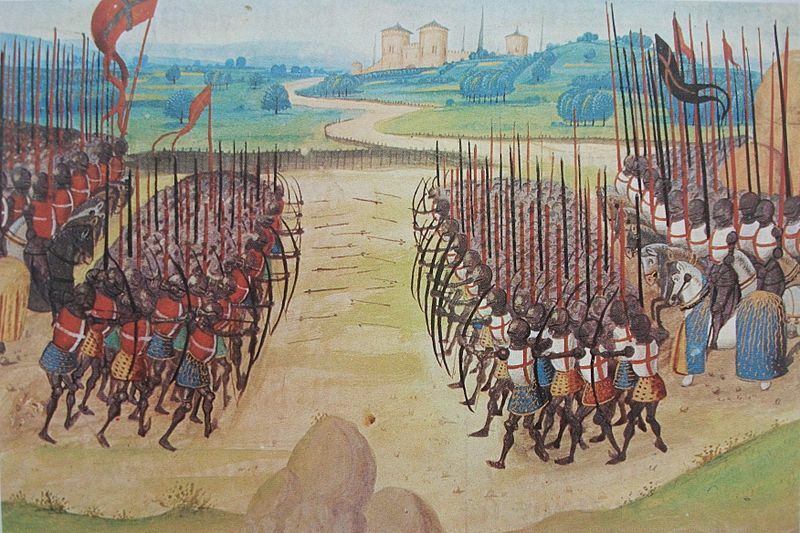 In total there were sixteen knights and squires with 182 archers between them. Many of the surnames belonged to well-known Cheshire families. Several knights on the list were appointed commissioners, as indicated by the abbreviation “Chr.” The question was: who was the king that they accompanied through the county? Among the knights were representatives of the leading nobility of the county, such as Sir Thomas Grosvenor, an ancestor of the present-day Dukes of Westminster, and William Cholmole, probably an abbreviation of Cholmondeley. The prominences of these names made it possible to conduct a basic internet search to find them on various genealogical websites. To my surprise, several of the knights had lived no later than around 1420 (although the tendency for families to reuse forenames made it difficult to narrow down, a few had only one occurrence in the 15th century). That would suggest the reign of Henry V. In fact, some had even fought in the battle of Agincourt alongside the King, such as Sir Philip Leche, Ralph de Bostok and Sir John Savage. Archers were instrumental there in defeating the much larger French force of armoured knights. What was still unclear was whether this roll dated from before or after the battle, as Henry returned to France after the victory to consolidate his position, and he may have been travelling through the county either to raise revenue or rally his forces. Interestingly, further research indicated that Cheshire was renowned for the quality of its longbowmen, and Henry (who had been Earl of Chester before acceding to the throne) recruited 700 men from the county in 1415 before the battle. He returned several times subsequently for more men, and biographical details on Ralph of Bostock state that he was one of 15 captains who led 180 archers on another expedition to France. This seems highly likely to be the occasion concerned in the roll.